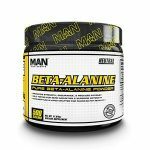 MAN Sports Beta-Alanine Review | Buy or a Scam? MAN Sports Beta-Alanine is a powder supplement that contains CarnoSyn as the sole ingredient. It is advised that you take this supplement as a drink before and after your workout so that it buffers lactic acid and helps muscular endurance. We uncover whether MAN Sports Beta-Alanine will make an impact, any side effects you may encounter, and what results you should expect to see. No comments Page updated Mar 15, 2019. First published Feb 26, 2018. MAN Sports Beta-Alanine is a straight forward supplement, that contains a branded Beta-Alanine product called CarnoSyn as the sole ingredient. So if you want to experience the Beta-Alanine tingle and improve muscular performance, it looks like a way of achieving this. We find out more about this supplement, and whether the claims about Beta-Alanine as a sports supplement really stand up to scrutiny. MAN Sports is a US company that specialises in a wide range of supplements for athletes and bodybuilders. 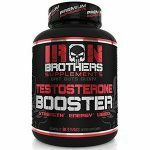 The company is based in Texas and although they fail to provide a full address, just a PO Box in Mesquite, you can also buy MAN supplements from a choice of independent retailers. A recently added chat facility on the MAN Sports website may be helpful to customers with questions. MAN Sports Beta-Alanine is a sports supplement that you are advised to take as a drink before and after your workout, in order to increase carnosine levels and so improve endurance, performance, and muscle building. The sole ingredient is a branded supplement called CarnoSyn, which is the best known Beta-Alanine brand on the market. If you are looking at trying CarnoSyn or Beta-Alanine, this could be a good choice and with each tub containing 250 servings, it looks like good value as well. What are the side effects of MAN Sports Beta-Alanine? This supplement looks safe. The only reported side effects to Beta-Alanine are a tingling sensation and/or flushed skin tone. How much does MAN Sports Beta-Alanine cost? MAN Sports Beta-Alanine looks like good value compared to many other Beta-Alanine supplements on the market. Buy from the official MAN website and 1 x 500g tub (250 servings) costs $29.99. You can find MAN Sports Beta-Alanine on sale from some independent retailers in the USA, including A1 Supplements. UK MAN Sports stockist, Cardiff Sports Nutrition also has Beta-Alanine on sale where it costs £28.99 plus postage to UK addresses. MAN Sports Beta-Alanine is a supplement in powdered form, that you simply add to water or juice in order to make a drink. Unlike many other MAN Sports supplements, this one is in neutral flavour rather than the crazy choice of flavours we have come to associate with this brand. Beta-Alanine is a modified version of the amino acid Alanine, which in turn is an amino acid (protein building block) of Carnosine. Carnosine is concentrated in the muscles, although it is also found in other parts of the body including heart and brain. There is strong evidence that improving carnosine levels via supplement use can help improve athletic performance and endurance. So, why take Beta-Alanine and not Carnosine? After all, both are available in supplement form? The answer is not straight forward and some people do take Carnosine supplements. However, Beta-Alanine is more easily absorbed by the body and is well researched as a dietary supplement. In addition, it seems that taking Beta-Alanine, the precursor of carnosine, may be more effective for raising carnosine levels than taking carnosine itself. This is a topic of debate amongst bodybuilders. MAN Sports Beta-Alanine contains a branded product called CarnoSyn as the sole ingredient. CarnoSyn is a leading, some might say THE leading Beta-Alanine powder on the market. CarnoSyn is safe and has been well researched. It is not available to buy directly by customers because it is only available to the supplements industry. However, it shows up in many supplements on the market such as well known brand, GNC with GNC Mega Men Sport. Unlike many other supplements on the market, MAN Sports Beta-Alanine contains only CarnoSyn as the sole ingredient. It is not blended with other ingredients or even flavourings. Although Beta-Alanine seems safe, you do seem to have to take it regularly. Is it really worth the hassle? 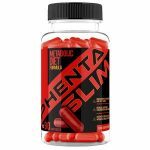 There is very little feedback available and this supplement is not on sale via Amazon as is the case with many other MAN Sports supplements. Why? We have covered numerous MAN Sports supplements in previous reviews. Some of these like Beta-Alanine focus on a specific amino acid such as MAN Sports L Carnitine, and MAN Sports ISO Amino, a BCAA supplement. Others are more general, such as MAN Sports Blockbuster, a pre-workout supplement. What does MAN Sports Beta-Alanine claim to do? We can’t see the point of these last two claims. After all the sole ingredient has not been manufactured by MAN Sports, so taking the credit for quality is a bit like buying a shop bought cake and then passing it off as your own work. Does MAN Sports Beta-Alanine work? Yes. MAN Sports Beta-Alanine will work. It contains only CarnoSyn the market leader in all Beta-Alanine supplements so is a good quality product. The serving size is effective and equal to 2000mg, so take as advised before and after a workout as recommended and you are within the recommended standard dose of between 4000mg to 6000mg. According to the International Society of Sports Nutrition, who carried out an overview of all the clinical testing into Beta-Alanine, the results were very impressive. Four weeks of beta-alanine supplementation (4-6 g daily) significantly augments muscle carnosine concentrations, thereby acting as an intracellular pH buffer. Beta-alanine supplementation currently appears to be safe in healthy populations at recommended doses. The only reported side effect is paraesthesia (i.e., tingling) but studies indicate this can be attenuated by using divided lower doses (1.6 g) or using a sustained-release formula. Daily supplementation with 4 to 6 g of beta-alanine for at least 2 to 4 weeks has been shown to improve exercise performance, with more pronounced effects in open end-point tasks/time trials lasting 1 to 4 min in duration. Beta-alanine attenuates neuromuscular fatigue, particularly in older subjects, and preliminary evidence indicates that beta-alanine may improve tactical performance. Combining beta-alanine with other single or multi-ingredient supplements may be advantageous when the dose of beta-alanine is sufficient (i.e., 4-6 g daily) and the treatment duration is at least 4 weeks. Serving size is equal to two scoops or 2000mg. You are advised to take before and after your workout. Beta-Alanine (as CarnoSyn) 2000mg: Leading brand used in many sports formulations to increase carnosine levels, and muscle building and endurance. Beta-Alanine (CarnoSyn) is safe according to the many clinical studies. The most noticeable side effect is a tingling sensation or skin flushing that you may experience after taking it. This is harmless but if it bothers you, the clinical advice is to take smaller serving sizes more regularly. Caution: Not suitable for individuals under 18. Avoid if you are pregnant or breastfeeding. There is currently no information about whether Beta-Alanine causes drug interactions. However, it is best to speak to your doctor before use if you have an underlying health condition or are taking prescription medication. There are no independent customer reviews available but there is one review left on the official MAN Sports product page. It may seem a bit cliché but I totally feel like Super Woman when I take this with my ISO Aminno and Blockbuster! I’m able to absolutely kill my workouts regardless of how “not feeling it” I was prior to my shake! I love how it gives me the extra push to get my body and muscles right where I want! 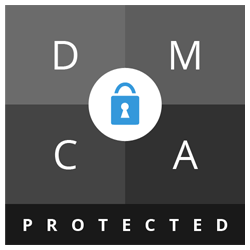 According to the small print, there is a 100% money-back guarantee, but the company do not provide any information about this in the T&Cs. You can buy MAN Sports Beta-Alanine directly from the official MAN website. It is also on sale from supplement retailers, including A1 supplements and more. UK customer can buy it from UK MAN Sports stockist, Cardiff Sports Nutrition. 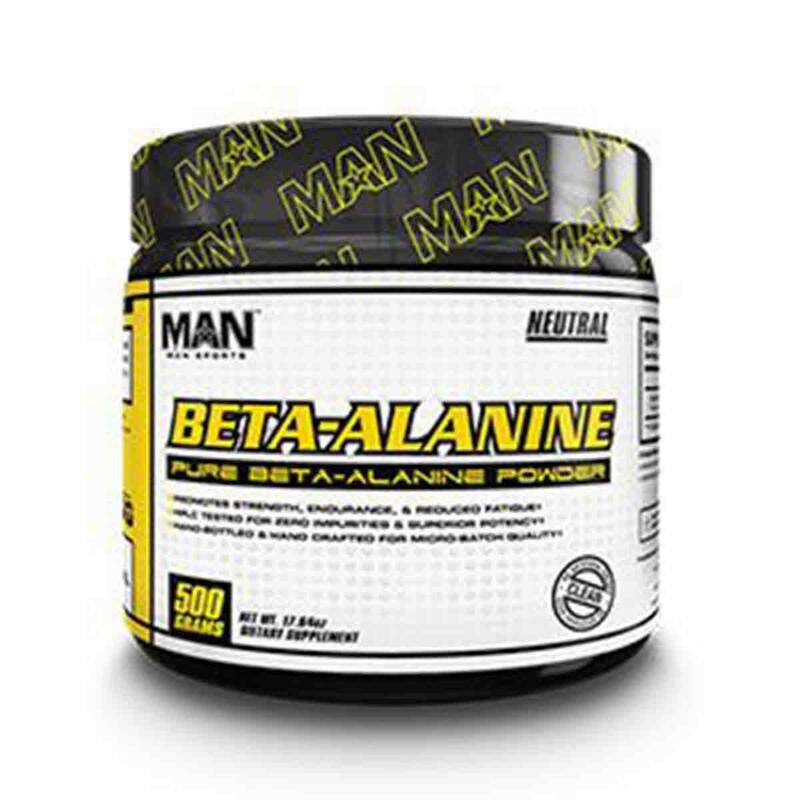 MAN Sports Beta-Alanine looks to be a good quality Beta-Alanine supplement and could be a good choice if you are specifically looking for this type of specialised supplement. It contains only CarnoSyn as the sole ingredient, so if the claims about Beta-Alanine are correct, there is no reason why this supplement should not work effectively. In addition, we like that there are no added ingredients and that Beta-Alanine has been extensively tested and found to be safe. We like the big tub of 250 servings and we think this looks pretty good for the price, especially if you are in the USA and buy directly from the MAN website. There is an advertised money-back guarantee, and overall we do recommend MAN Sports Beta-Alanine to our readers that looking to try this ingredient for themselves. 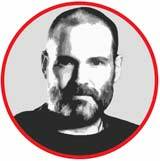 John has been passionately involved in the fitness and supplement industry for a number of years. He was also a competitive athlete during his twenties, and he still enjoys researching new training ideas and applying them to his ever-busy schedule. On top of this, John is a prolific writer for a number of online health and fitness and blogs, specializing mainly in nutrition. Purpose Cutting body fat, endurance, thermogenesis. Testosterone booster. Pre-workout, endurance. We'd love to get your opinion. Please keep it clean and stay on topic, no spamming. Comments are moderated before being made live. Your email address will not be published. We cannot give advice about medical conditions or prescription drugs. Please direct specific medical questions to your doctor. Get the conversation started by leaving your comments using the form above. © 2019 Watchdog Reviews Inc. All rights reserved.